Gorgeous waterfront home on Clear Lake offers 3 Bedrooms and 2 full baths (Jacuzzi tub for two), a huge deck overlooking the lake, fireplace, two-car garage, gas barbecue grill, fire pit, wireless internet, and all the conveniences of home. We have a dock out front so bring your boat or jet ski. Clear Lake is a 200 acre all-sports lake which as its name suggests, is crystal clear. The lake is up to 50' deep, has 3 islands, boat rentals, and a sandy beach. It is great for fishing, swimming, sailing, water skiing, as well as ice skating in the winter. Clear Lake is a small, friendly community. The property is within walking distance to two restaurants/bar and a convenience store. Also within a few miles are championship golf courses, hunting, 100's of miles of manicured snowmobile and ATV trails, wonderful cross-country skiing, and horseback riding. Available within a short drive is canoeing/kayaking on the Rifle River or AuSable River. In the picturesque town of West Branch you will find fine dining, a cinema, antique stores, outlet mall shopping and much more! I grew up in Bay City, Michigan and spent my summers at the lake swimming, fishing, waterskiing and well, living the good life. 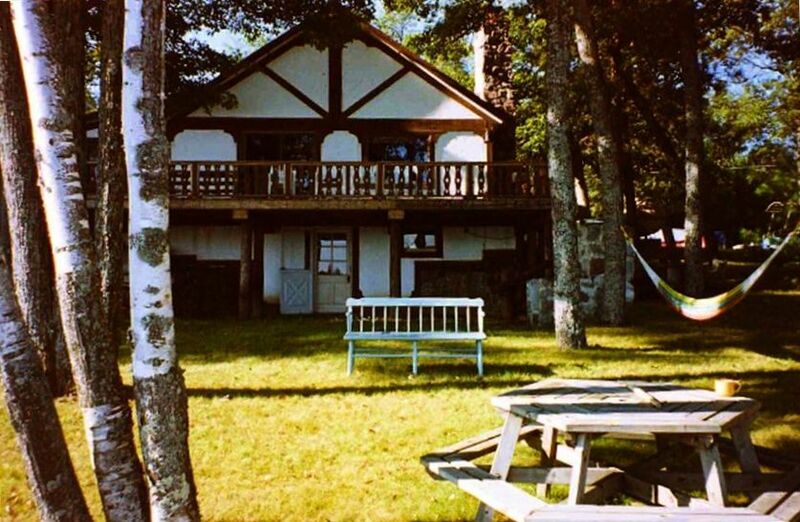 My father eventually moved to the cottage on Clear Lake and it became our family home for many years. Now it is a vacation home and still one of my favorite places on earth. I live in Los Angeles where I work as a director in film and television, but each year I find time to return to my idyllic cottage on Clear Lake. I hope you enjoy it, too. There are some spices and condiments, paper towels. The water from the tap is excellent for drinking. This cottage was clean and large enough to accommodate 6 adults. Kitchen was well equipped and there was enough seating for everyone to eat at the table. The beds were comfortable with lots of extra blankets for the chilly nights. It is quite close to the neighboring cottages, but still quiet during the week and at night. This is a great place for families withteenaged children and pets. This rustic cottage has all the conveniences of home. The kitchen is well equipped and there is plenty of room. Our family loved the privacy of the lake and enjoyed sitting out on the lawn near the water where we swam, jet skied and watched the sun set and rise. Jackie and Randy were very accommodating and we hope we can do it again next year. We had such a great time up at Clear Lake! Thank you Jackie and Randy for making our stay so nice! The cottage came with many items to make our stay comfortable. The location was perfect for swimming and boating. I recommend this cottage to everyone who wants to stay on Clear Lake. Being from California, I had never really seen fall color, so we decided upon Michigan this year to have a real "autumn" experience. We spent several nights at this lovely cottage on Clear Lake. Because of the time of year, it was quiet and tranquil and the view across the water was gorgeous. The autumn weather was lovely and the leaves were vibrant. It was warm enough during the day to go out and walk in the woods, and kayak and paddle board, but cool enough in the evening to snuggle by the fire place (which works and warms great). I don't think the photos of the cabin really fairly show how close you are to the edge of the lake; you can hear the water lapping against the shore. The cottage is a wee bit dated, but I found that entirely charming and warm. The owner has recently added WiFi service, so that is not longer an inconvenience. And the food at the local bar is pretty dang good. Highly recommend a stay here on Clear Lake. My idea of the perfect, cozy, rustic cottage on a lake in Michigan. Met up with family members that are now spread across the country and we all had a great time. The cabin had plenty of room and the big front deck facing the water offered a beautiful view. We played many games on the spacious front lawn, roasted marshmallows in the fire pit, and took many cruises around the gorgeous lake dotted with tiny islands. It felt like going back home again, eating perch dinners, playing cards & board games, with the setting that made us feel so comfortable and....relaxed. We'll be back! We had a great week on Clear Lake. Lots of room at a beautiful location. The renters were very helpful and very nice. I would recommend this place to anyone. There is a deer park ten minutes away where kids can see deer up-close and feed them.